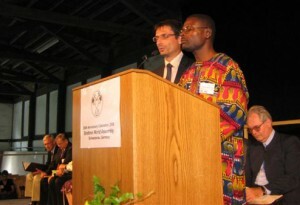 Dr. Francois Ngoumape, Central African Republic, and Florent Varak, France, participated in the Brethren World Assembly in 2008. 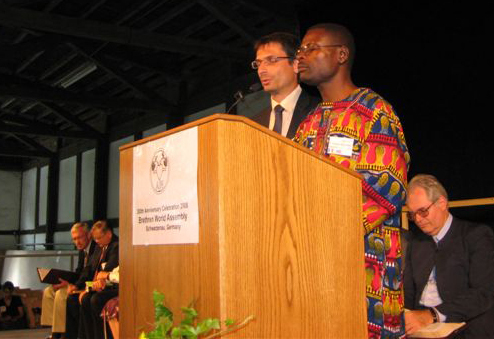 A Brethren World Assembly, consisting of constituents and friends of the Brethren groups descended from the German Anabaptist/Radical Pietist religious leader Alexander Mack in the early 1700s, will be held in the Dayton, Ohio, area Thursday through Sunday, July 11-14, 2013. The meetings will be hosted by the Brethren Heritage Center in Brookville, Ohio, with evening worship services in the Brookville Grace Brethren Church and the Salem Church of the Brethren. Utilizing the theme “Brethren Spirituality: How Brethren Conceive of and Practice the Spiritual Life,” the program will include daily plenary addresses, workshops and panel discussions on such topics as “Brethren Hymnody,” “Separation from the World and Engagement with the World,” “Brethren Devotional Literature and Poetry” and more. Friday and Saturday afternoon tours will be offered to historic Brethren sites in the proximity of Brookville and southern Ohio. A planning committee for the event has been meeting regularly and is being led by the Rev. Robert Alley, immediate past moderator of the Church of the Brethren. Other groups participating in the event include The Brethren Church, The Fellowship of Grace Brethren Churches, Conservative Grace Brethren Churches International, Dunkard Brethren Church, Old German Baptist Brethren Church and Old German Baptist Brethren Church, New Conference. The Brethren movement had its origin in Schwarzenau, Germany, in late summer of 1708 when reformer Alexander Mack and seven others participated in believer’s baptism in the Eder River. Registration will open at 9 a.m. on Thursday, July 11, 2013, and the assembly will conclude with Sunday worship services at congregations of the various Brethren groups. Further details regarding lodging, registration costs, and specific program details will be released as the event draws closer. Updates will be available through brethrenencyclopedia.org and through the Brethren Heritage Center at brethrenheritagecenter.org.